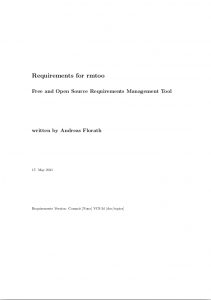 rmtoo is a free and open source requirements management tool. rmtoo uses a different approach than most other requirements management tools: it comes as a command line tool which is optimized for handling requirements. The power of rmtoo lies in the fact that the development environment can handle the input and output files – there is no need for a special tool set environment. Example: if you need to handle baselines (and there often is), rmtoo can be configured using a revision control system (e.g. git). The revision control system can handle different revisions, baselining, tagging, branching and many other things extremely well – there is no reason to reinvent the wheel and making it less efficient. Let one thing do one thing. For evaluation and running small projects there is the possible to use a preinstalled Amazon AWS EC2 virtual machine. It takes only some minutes until you can start your own project. For details please consult the Amazon AWS page of rmtoo. rmtoo fits perfectly in a development environment using text editors and command line tools such as emacs, vi, eclipse, make, maven. Fully integrated revision control system: git. Usages: history, statistics and baseline handling. SCRUM artifacts: all artifacts which are used in SCRUM are supported: e.g. Selected for Sprint, Assigned, Finished, Statistics, and Burndown diagrams. During parsing most common problems are detected: all syntax errors and also many semantic errors. Fully automated test environment – tests about 95% of the code and is shipped with rmtoo packages to check for possible problems in different environments. rmtoo is not a fully integrated, tries-to-do-everything tool with a colorful GUI or different database backends. The project is hosted on github. There is a project infrastructure including a git repository, bug-tracker, news and forums. rmtoo can also installed using pip and pypi. rmtoo works well as a requirements management tool. It is currently used in commercial and open source projects all over the world. Because there were no bug reports or user requests for some time, there were no new releases for some month now. rmtoo comes with man pages which describe the functionality, the input and output files. 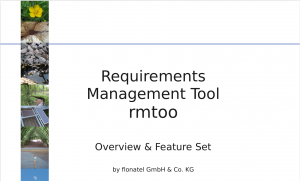 Included in the rmtoo package is a set of requirements that describe the rmtoo functionality itself. This provides a good overview of rmtoo and is a good starting point for working with rmtoo. There are two presentations which give an introduction to rmtoo. This is a good starting point to get an impression of how rmtoo can be used in your projects. The first presentation gives an rough overview about all the features of rmtoo and reasons why and when rmtoo should be used in a project. This presentation also includes a Do’s and Don’ts list and can be seen as a management summary. The second presentation goes in much more detail. This explains the input and configuration files which are used. It gives also an overview over the different output artifacts. rmtoo is self contained in the sense that the requirements for rmtoo are described with the help of rmtoo itself. Because the document was created with the help of rmtoo this can be seen as an example of an output document, including backlog, list of requirements that must be further elaborated upon and all requirement descriptions. 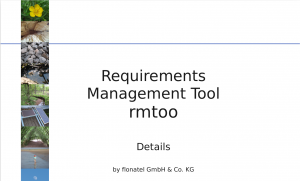 The requirements document for rmtoo describes every feature in detail. The document also includes a roadmap, which describes the planned but not yet implemented features. The requirements dependency graph is one rmtoo output artifact. There is a requirements dependency graph available which describes the current state of rmtoo itself. The topic based requirements dependency graph is similar to the standard requirements dependency graph, except that the requirements for one topic are clustered. One supplied output module writes data in the format that it can be read by the Data Visuzalization Software ‘Tulip’. Please note that the Tulip application operates on graphs – and not on digraphs. Therefore some information of the dependency graphs cannot be displayed in Tulip. It is possible with Tulip to layout graphs in 2D and also in 3D. Here are two lists of links: one list provides more information about rmtoo itself and the other shows links to other requirements management tools. Requirements Management Tools from Ludwig Consulting Services: List of available requirements management tools. This website also discusses a lot of different aspects of requirements management. Requirements Tools at Volere: Another list of requirements tools – each with a short description and the major features. Requirements Tools List from Ian Alexander: On this page, the tools are divided into different subject areas. OSRMT: This is an open source requirements management tool. It comes with a GUI. There are no long development cycles: when a new feature is implemented, a new version is released. Therefore a new version is sometimes released just a few days after the previous one. If there is a new feature it is fully available when it is released. rmtoo is copyright flonatel GmbH & Co. KG and Andreas Florath. The tool is licensed under GPL v3.